Liverpool is at the centre of the UK’s second largest regional economy with access to six million customers. The city is home to an estimated 478,580 people, making it the largest city within the county of Merseyside as well as the 9th largest in the United Kingdom. Liverpool is also one of the UK’s oldest port cities and home to the longest established Black African community in the UK. Liverpool’s port was, for hundreds of years, the key trade hub for the North East of England. Throughout the industrial revolution, it handled general cargo, freight and raw materials. It also it played an integral part in the slave trade and in the 19th Century it was a major port for English and Irish migrants travelling to the Americas. Liverpool’s four universities produce 16,500 1 graduates every year, adding to the already vast talent pool of the city. Liverpool is the recent recipient of a wealth of investment, with £7 Billion worth of development projects to be completed over the next decade. More than 8,000 businesses employ more than 70,000 qualified professionals in Liverpool, making it a dynamic and thriving city region. 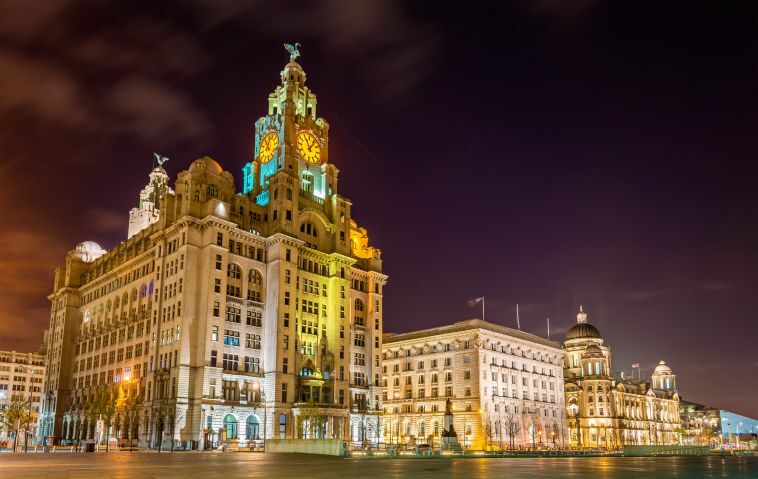 Liverpool is also the largest city for asset management firms outside of London and is home to the likes of Rathbones PLC, one of the UK’s leading investment management firms 1 . The Merseyside regional economy has 266,000 businesses, is worth more than £149 billion 1 and has strong connections to most global markets. 45% of North America to UK trade enters through Liverpool’s port 1 and the city is one of the largest automobile production hubs in the UK, with companies such as Jaguar Land Rover and BAC MONO based in the area. It is also one of the UK’s 6 centres for offshore renewable energy and is home to the Burbo Bank Wind Farm, which houses the world’s largest wind turbines 1 . The property market offers some of the best value in the UK following the £5 billion completion of development projects over the past decade and the city’s three enterprise zones also offer great support and incubation for start-up businesses. Nearly 23,000 people are employed in creative and digital businesses in Liverpool, including gaming, music, digital media and design 1 . The city has the strongest games cluster outside of the South East and has the UK’s only games development school (for 14-19-year-olds). 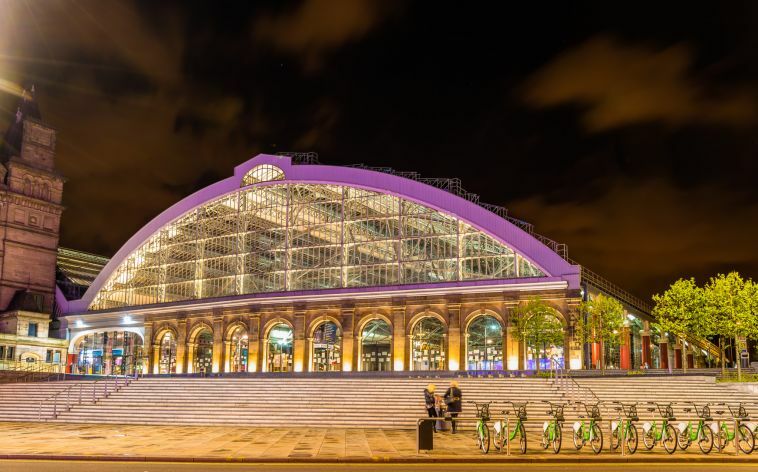 Liverpool is one of the UK’s most connected cities; two major airports within a 45-minutes’ drive of each another and seamless access to London, only two hours by train. Furthermore over 6 million people are within an hour’s drive of Liverpool and the entire population of the UK can reach it by car in a day. In 2015, Merseyside’s economy grew faster than anywhere in the UK. The city's gross value added (GVA) rose by 3.1%, ahead of Manchester, at 3% and London at 1.6%. However, Liverpool has poor employment figures when compared with the UK average of 69.7%; only 63.4% of the city’s working age residents are economically active 2 . Wages in Liverpool are 10% lower than the national average and 50% lower than the City of London 1 . The city has 34,000 people employed in the maritime and air travel sectors. A £300 million investment in the Post-Panamax facilities is underway and will add around 750,000 Twenty-Foot Equivalent Unit (TEU) capacity. Liverpool has up to 10,000 employees in the Life Sciences sector too, with revenue in excess of £1.7 billion per annum and contributing over £170 million per annum in GVA to the local economy 1 . World leaders in the industry, including Astra Zeneca, Seqirus and Lily all operate in the city. The city is home to the Range Rover Evoque and Land Rover has announced that its Discovery Sport will enter production at Liverpool’s Halewood plant, following its £230 million expansion 1 . Liverpool’s commercial property market is one of the UK’s best in terms of value for money. Rental levels have remained remarkably consistent over the previous four years, with headline rents at £20.50 per sq ft for Grade A space within the commercial district. No new developments are underway despite 1,293,958 sq ft being available in the commercial district alone 3. Overall Office take-up for the Liverpool City region was 523,456 sq ft in 2016, a 9.3% fall on the 2015 figure of 576,847 sq ft 3 . Total office take-up in the commercial district in 2016 was 342,714 sq ft, up 13% from 2015 and the second highest take-up since 2009 3 . Office Supply continues to fall in the commercial district, with 1,293,958 sq ft remaining. In 2016 there was 942,532 sq ft of vacant office supply in the city fringe and out of town markets, representing a decrease of 217,016 sq ft from 2015 3 . 2016 also saw over 1.3 million sq ft of investment transactions completed in the commercial district. The largest deal was the sale of Exchange Flags (350,000 sq ft) to Shelborn Asset Management 3 . The largest deal of 2016 in the commercial district itself was Liverpool John Moores University, acquiring 58,264 sq ft at Exchange Station 3 . The small office market (sub 1,000 sq ft) still represents an important sector, comprising 51% of all transactions (54% in 2015), although the actual number of transactions was down from 85 in 2015 to 61 in 2016 3 . The city’s retail district is based around Liverpool One, the city centre shopping centre which opened in 2008. The development cost of the project was £500 million, creating a total investment value of £920 million. 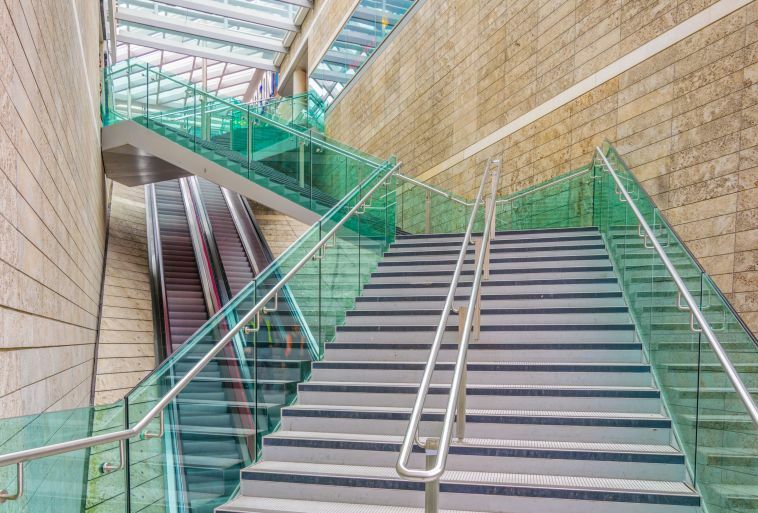 It has since created over 5,000 permanent jobs and has 1.5 million sq ft of developed space 4 . The development consists of over 200 shops, more than 500 apartments, two hotels, 25 restaurants, a 14-screen Odeon cinema, four office buildings, a revitalised five-acre public park, 2,000 car parking spaces and a public transport interchange. The main ongoing development for retail in the city is the £100 million Edge Lane Retail Park. Work started in 2016 and phase one is expected to be completed in 2017. The site, which measures more than 700,000 sq ft, will also be home to 41 shops and will have parking space for 1500 cars 4 . Land and property costs are lower when compared to Essex or Southampton, with warehousing available for £4.50 per sq ft. Five of the world’s top six shipping and logistics companies have a base in the city 1 . Atlantic Park is Liverpool largest and most established business park. The site offers a range of bespoke design and build solutions for office and industrial occupiers and has planning consent for 800,000 sq ft of B1, B2 and B8 space5 . Liverpool’s creative and digital industry is on the rise. With this comes a rise in demand for cheap, connected office space. In the city, multiple start-ups and developing businesses are filling the capacity of co-working and serviced office spaces. Many of the city’s sites now include business advice incubators to help maintain the city’s strong network of entrepreneurs. Here is a brief overview of shared office space in Liverpool. Situated at three different locations across the city, Signature works provides co-working and office space to Liverpool’s businesses. Their space totals 19,000 sq ft and includes 3 floors of office space at the Bling Bling building, next to Liverpool Central Station. Memberships include access to gyms and spas as well as access to their in house ’incubator panel’, offering business advice for growth and expansion. Avenue HQ Liverpool, supported by Eagle Lab, is located at Mann Island, a stunning location overlooking the historic waterfront. It has been specifically designed around the needs of the local community with a 200 seat co-working space for entrepreneurs and businesses and a ‘maker space’ to support rapid prototyping of concepts. With a range of support services, including access to expert mentoring and funding opportunities, the facilities include hot-desks, dedicated desks, open plan spaces and private offices. This unique shared office space, inside the Baltic Creative Campus, is home to Basecamp, a company which supplies co-working space for Liverpool’s developing businesses. Clients can choose from a dedicated desk or a hot desking option. The company focuses on collaboration and has expert support available on site from experienced and professional advisers. Membership includes the free use of meeting rooms, 24/7 access and high-speed broadband. Offering office and co-working space around the UK, Spaceworks has 5,532 sq ft of office space in Liverpool’s Tea Factory, the city’s media and creative flagship. They also offer co-working in their’ Business club’ and have 2 meeting rooms available for hire on-site. They are situated in the Ropewalks only five minutes walk from Liverpool Central Station and close to a myriad of restaurants. Located in the heart of the Baltic Triangle - Liverpool's creative quarter and home to over 200 digital, media and design companies, Baltic Co-working Space is a unique environment inside a fully renovated former factory. It is already home to over 18 creative companies as well as a fantastic on-site coffee shop, lunch venue and bar. Individual desks are available from £99 per month. The world’s largest provider of workspace, Regus has four buildings in Liverpool city centre and a further four in the surrounding area. Regus offers workspace customisation in contemporary properties situated at prestigious locations within Liverpool, including a new letting in 1 Mann Island. With an ease of office space scalability, from coworking to dedicated offices and meeting rooms, Regus is the premier office provider in the city. Liverpool’s connectivity is one of the city’s key strengths. With two major international airports (within 45 minutes of each other) and a central UK location, the city maintains strong rail and road links within the UK and has one of the busiest ports in the nation. Liverpool John Lennon Airport is located within 15 minutes of the city centre and was the UK’s 12th busiest airport in 2016, handling 4,778,939 passengers 6 . Manchester International airport is only 45 minutes from Liverpool and can be easily reached via bus or train. Liverpool Lime Street connects the city with London in a little over 2 hours. Manchester can also be reached in just over 30 minutes. Liverpool hopes to benefit from the follow up to HS2, cutting travel time into London to 93 minutes. Inner city rail travel is achieved in Liverpool via the underground Mersey Line, which has four city centre stations including Liverpool Lime Street and Liverpool Central. This is also connected to the surrounding area of Tranmere and Birkenhead allowing for easy commuter travel. The ethnic composition of Liverpool is much less varied now than in the past, when notable migrant groups developed in the city. In 2009, the ONS estimated that 91% of the population were White, 3% Asian, 1.9% Black and 2.1% Chinese. 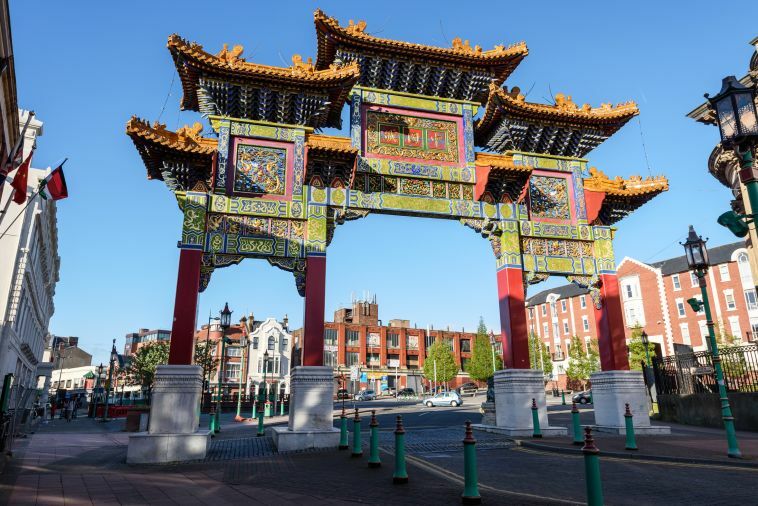 Liverpool is home to Europe’s longest standing Chinese community, dating back to the 19th century. The ornate gateway at the entrance of Liverpool’s Chinatown district is the largest outside of China 7 . The city also has the UK’s longest standing black community, dating back to the early 1700s, when seamen and freed slaves made Liverpool home. Liverpool’s GVA per head is £22,790, below the UK average of £25,351 (and also below that of the ‘core cities’ average of £25,966) 8 . The city region boasts two Premier League football clubs, Everton and Liverpool, based just one mile apart from each other. Liverpool FC has won five European Cups, the most by any UK club. The region is home to England’s Golf Coast, the finest stretch of championship golf courses in the world, including three Royal Links courses which have hosted numerous Open Championships and Ryder Cups. Horse racing is a massive part of the city’s sport; Aintree and Haydock offer some of the UK’s finest horse racing events, including the Grand National at Aintree. Liverpool Echo Arena seats 10,600 people and has hosted multiple large-scale events in boxing and gymnastics. The stadium has hosted over 3,000 events, attracting more than 6 million people. The arena alone has generated £1.3 billion towards the local economy. Liverpool has more museums and galleries than any other UK city outside of London, including Tate Liverpool. The city has 15 theatres and performance halls, including the Art Deco inspired Philharmonic Hall, home to the Royal Liverpool Philharmonic Orchestra. Liverpool Empire Theatre is the second largest in the UK and hosts a wide variety of shows, often arriving directly from London’s West End. Liverpool has been the birthplace to many of the UK’s greatest bands including the Beatles who claimed 17 UK and US number ones. The Beatles may remain Liverpool’s most successful export, but recent bands such as The Wombats and Circa Waves have also found national and international success.